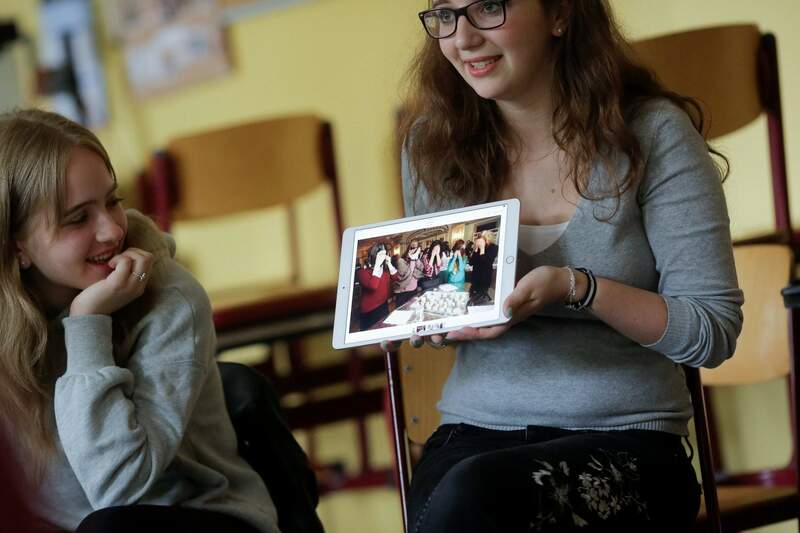 Jewish teenager Sophie Steiert, right, shows a picture of Jewish daily life on a tablet computer as Laura Schulmann looks on during a lesson at a high school in Luckau, Germany. With the number of Holocaust survivors dwindling and schoolchildren now at least three generations removed from the Nazi genocide, teenagers have been recruited as the next ambassadors for the Jewish community in Germany. Teens related to other teensEnter Steiert and her friend Laura Schulmann, two girls from Berlin who want to change perceptions and challenge stereotypes as their community’s 21st century ambassadors. 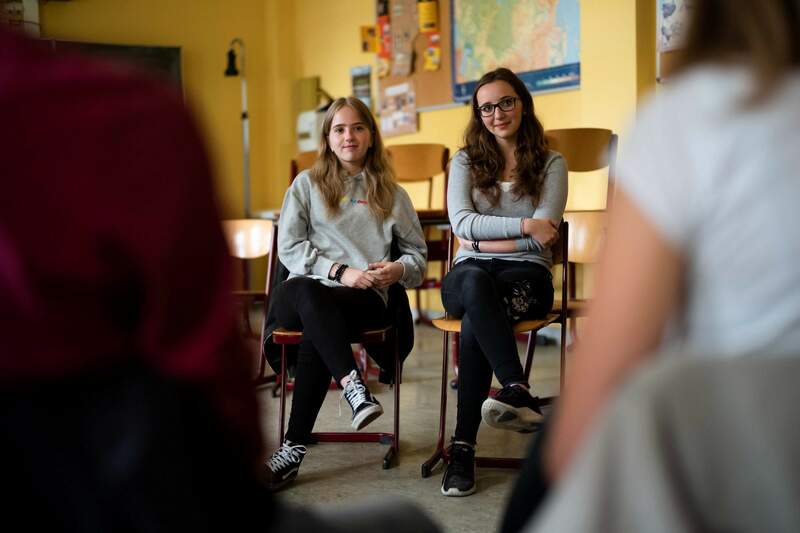 Laura Schulmann, left, and Sophie Steiert listen to questions from students about Jewish daily life in Germany during a lesson at a high school in Luckau, Germany. She digressed briefly to cover what else very religious Jews do or don’t do and ended up explaining that texting and everything else one might do with a cellphone are off-limits from sunset Friday until Saturday evening, if one observes the Jewish Sabbath, or Shabbat. Anti-Semitism creeps backGermany’s population of 82.8 million now includes only about 200,000 Jews. Berlin has the biggest concentration, about 40,000. Before Adolf Hitler and his Nazi Party came to power, Germany had a Jewish population of about 500,000. Laura Schulmann, center right, and Sophie Steiert, center left, listen to questions from students about Jewish daily life in Germany during the lesson at a high school in Luckau, Germany.